Participants from Germany shall send their log to Heike, DL3HD (dl3hd@darc.de) while participants from other countries shall send their log to Sophie, F4DHQ (f4dhq@orange.fr). 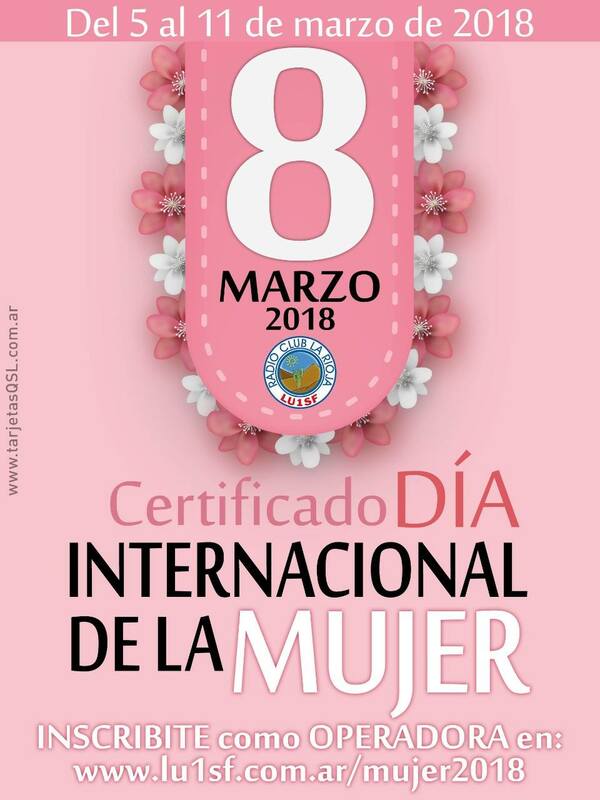 Will be awarding a special certificate in celebration of International Womenns Day – March 8, 2018 – for contacts during the week. All bands For more info see their Facebook page. Hello Ladies – March is OUR month! 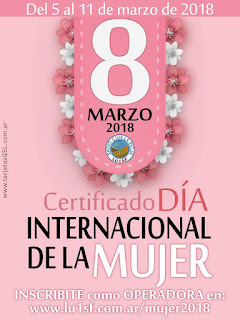 International Womens Day is celebrated every March 8 and for our Radio yls there will be lots of opportunites to make contacts (Hopefully the sun will also be with us?) Please join the French and German ladies, or the South American ladies – maybe both! And if you unable to make contact, then the Dutch ladies will be available for the rest of the month. YAY! And there is CLARA's Chatter Party . 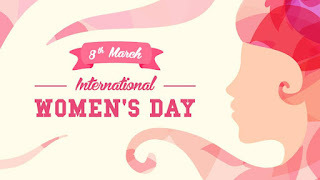 So even if it is not Womens Day in your country, reach out to our women-on-the-air during March!. womens-dayThursday 8th of March is International Women’s day, many countries in the world celebrate the achievement of women in society. YLs in countries around us therefore organize contests and special awards. As on March 17th and 18th we will participate in the Russian DX contest we decided to call this March our month. We did some quiet preparations and can finally tell that after more than twenty years the Dutch Young Ladies Club will have an YL-award again! From the 1st up until the 31st of March nine (!) YLs of the PI4YLC contest team will activate their calls. 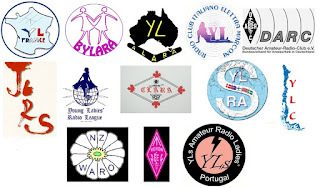 When a QSO is made with (a minimum) of three of these YLs a special YL-award has been earned. It will be downloadable from our website. Unfortunately the call PI4YLC itself cannot count for the award because of partcipation in the Russian DX contest. More information on what the YL-award will look like and where it will be downloadable will follow in near future. We hope for many nice QSOs with radioamateurs all over the world! During 2018 there will be featured a YL of the month. This is an idea that was brought up at the SYLRA Kungsbacka meeting in 2017. 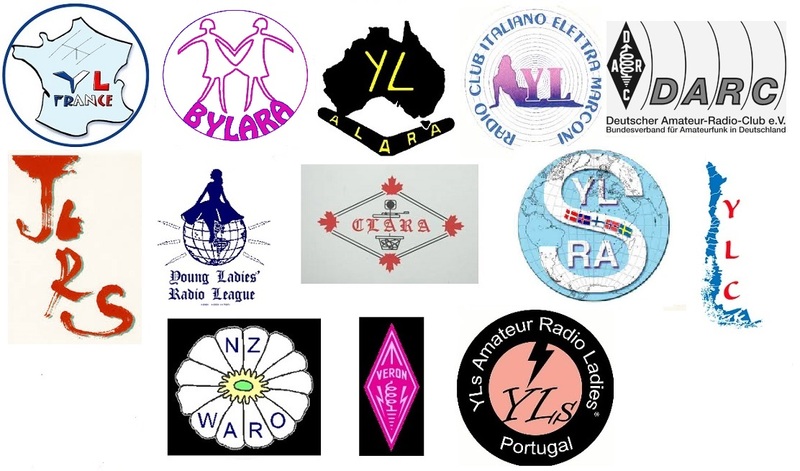 We have been asking several YL to answer several questions about them selves as radio amateurs, including a photo. If you are a SYLRA member and would like to participate (this is nothing serious, just fun, hi) please contact the webmaster Anna at tf3vb@sylra.is for further information. On 31.01.2018 the last QSOs were worked. This great relay activity was completed ln 1 year, which no one had expected. In the CQ DL 04/2018 we will publish a detailed report about the more than 40,000 QSOs ! Many thanks to all YL s who participated in this campaign and the numerous calling stations. I am already looking forward to many participants and wish you all fun and good luck! Laura Bergmann is only 11 years old (2018) and on January 30, 2018 she passed her Extra Class exam (Class A) at the BNetzA in Eschborn [Frankfurt area] . She may be the youngest radio amateur in Germany and one of the youngest in Europe. Congratulations on this extremely remarkable achievement! Her dad proudly said, "We learned and practiced diligently, it was not easy, but with a lot of fun, mutual motivation and purposefulness we made it and we are happy to hear Laura on the air with her new call sign DL2JJ." WRTC - World Radiosport Team Championship, is an amateur radio contest. An invitation-only event in which the world's elite contesters compete against one another using amateur radio stations that are in one geographic area of the world and are equipped with similar antennas and operating restrictions. VOTA-Award - The "Volunteers On The Air "
VOTA-Award" Can be obtained by all radio amateurs and SWLs via the DARC-Community-Logbook (DCL). The award aims at working WRTC 2018 volunteers to collect VOTA Numbers. VOTA Numbers will be distributed by registered volunteers of the WRTC 2018 from January 1st until December 31st 2018. Volunteers-On-The-Air -- VOTA Award for 2018. This award recognises that the volunteers are at the core of the radio world team championship in Germany without whom it would not be possible. Volunteers, set up antennas and tents, look after the competition sites and participants and work in the event office. Each registered volunteer has an exclusive VOTA number for 2018 and can give it out though his or her amateur radio activities. The volunteer thus represents the WRTC on the air. The VOTA Award can be applied for via the DCL (DARC Community Logbook https://dcl.darc.de). (diploma conditions on the web page). The diploma application is generated automatically and the VOTA numbers list stored in the DCL. So far,(Jan 2018) over 125 VOTA numbers have been issued. Among the list is exotic number DP-001, which will hopefully be activated soon by DP1POL (DL5XL). Among the helpers there are quite a few Yls , be sure to look for them.- list below. Well, I participated in my first ARRL November Sweepstakes this weekend, and had been preparing the week before by getting familiar with the Icom IC-765, the Win-Test logging software, and figuring out which of the multitude of antennas to use with the many different bands from which to choose. I was overwhelmed to say the least! Initially, I thought there’d be a half-dozen other operators at W0AIH's ham shack at "the Farm" as in the other two contests I’d been in, but what a shock to learn I'd be operating all by myself! It seemed impossible that I’d even be able to turn everything on, let alone operate all weekend! With a break overnight to go home and sleep, I wound up operating 21 hours, getting 38,106 points from 261 contacts in 73 different sections. Had SO MUCH FUN though as I finally got the hang of reciting the long "exchange" to each contact as we'd somewhat mimic an ARRL Radiogram format, "126 A KC9NZZ 08 WI" using my phonetic alphabet. The hardest part was getting the hang of immediately typing it into the computer, as I'd always written everything in my notebook first. Once I dumped that bad habit, it really picked up! I learned a lot of things for my next contest and can't wait to see how it goes in the future! I sure got the contesting bug! Paul stopped in several times to check on my progress, fix a few things when I couldn’t transmit, and encourage me. I received prior tips and hours of assistance online and even on the phone from fellow club members and Facebook group friends (ALL of whom are hams) I don’t think I could have ever managed to do this weekend without everyone’s help! Thank you! Danica Flyte 21 hours of operation and 261 QSOs for a total score of 38,106. I got 73 different sections. May the ionosphere rise to meet you. May the QRM be always in the background. May the sunspots shine warmly on your log. may you always hold your mike in the palm of your hand! Tony Coleman, ZS5ACB, went silent on Friday 9 February 2018. We extend our sincere condolences to Sheila, ZS5SC, Peter, ZS6PLC, Louisa, ZS6LU, Harry and John, ZS6JON, other family and friends. Port Elizabeth Amateur Radio Club (PEARS) regrets to announce the passing of Trevor Scarr ZS2AE, at the age of 85. Sincere condolences to Chris, ZS2AAW, Vanessa, ZS2VS, family and friends. 1 Portugal's National Summits on the Air Day (SOTA) started in 2011.